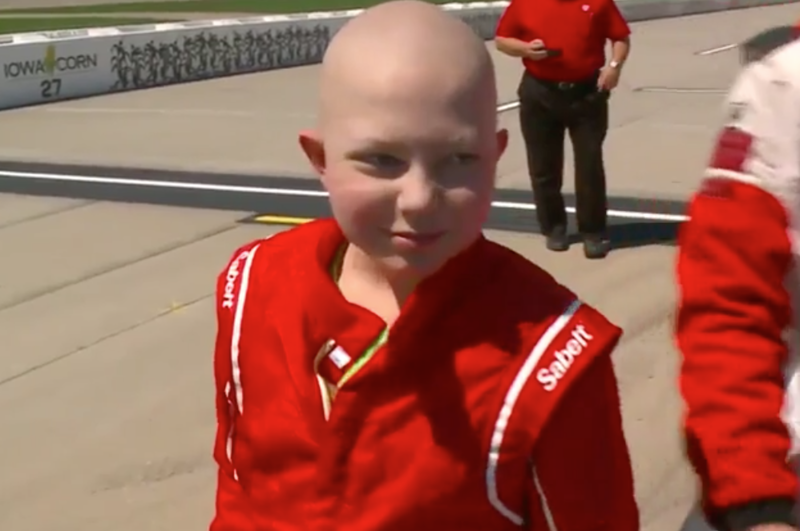 An Iowa boy with leukemia whose request for racing stickers for his coffin went viral has died, weeks after he got the ride of a lifetime at a NASCAR track. Caleb Hammond, 11, passed away on Monday after ceasing cancer treatments, CBS affiliate KCCI-TV reports. Hammond got the chance to drive on a NASCAR track and take a ride in a Ferrari race car with driver Kyle Larson after his story spread. Hours after his death on Monday, NASCAR's Twitter account expressed condolences to Hammond's family. "We race on in your memory today," NASCAR tweeted. "Our deepest condolences go out to the friends & family of Caleb Hammond." NASCAR also held a moment of silence before the Brickyard 400 at the Indianapolis Motor Speedway, the last race of regular season. The NASCAR community shares a moment of silence for 11-year-old Caleb Hammond, who died earlier this morning after a battle with leukemia. In August, Hammond began asking for racecar decals to decorate his casket. His family received so many that they asked the public to stop sending them. He was then given the chance to drive a racecar on a dirt track, and his story spread across the country. Garrett Hayim, the owner of a Ferrari dealership in Fort Lauderdale, Florida, sent a Ferrari race car, a driver and a racing suit all the way to the Iowa Speedway just for Hammond, KCCI-TV reported. After the run, Hammond told KCCI-TV, "This is something I'll never forget."